"Delicious traditional Dutch almond meringue cookies filled with butter icing and dipped in chocolate." Beat egg whites until foamy in a large glass or metal mixing bowl. Gradually add the white sugar, continuing to beat until stiff peaks form. Lift your beater or whisk straight up: the egg whites should form a sharp peak that holds its shape. Fold in the almond meal, cinnamon, lemon zest, and vanilla. Line a baking sheet with parchment paper. Transfer the meringue to a piping bag with a large plain tip (or a gallon-sized plastic zipper bag with the corner snipped off). Pipe the meringue into ladyfingers about 3 inches long. Set the pan aside and let the meringues dry at room temperature for 2 hours. Preheat an oven to 320 degrees F (160 degrees C). Bake the cookies on the middle oven rack until dried but not yet brown, 15 to 20 minutes. Allow them to cool completely. Make the filling by creaming the butter and confectioners' sugar until smooth. Stir in the vanilla. Meanwhile, melt the chocolate in the top of a double boiler over just-barely simmering water, stirring frequently and scraping down the sides with a rubber spatula to avoid scorching. 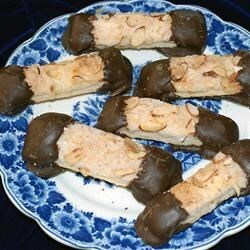 To assemble the cookies, spread buttercream on the back of a cookie, sandwich it together with another cookie, and dip both ends in the melted chocolate. Let the dipped cookies dry on waxed paper or parchment. Almond meal can be found in specialty stores and some supermarkets. One pound of almond meal yields about 4 3/4 cups. To make it yourself, grind 3 1/2 cups raw almonds with 1/2 cup of the white sugar in the recipe (the sugar helps give the nuts a finer grind). Proceed as directed. Great recipe - easy to follow instructions.